 Security Guards  Hotels  Theaters  And More! All items and materials are manufactured with pride and unsurpassed quality in the USA. We encourage you to call us and ask us to send you a swatch before placing your order. This is the best way for you to experience firsthand the quality of our product. 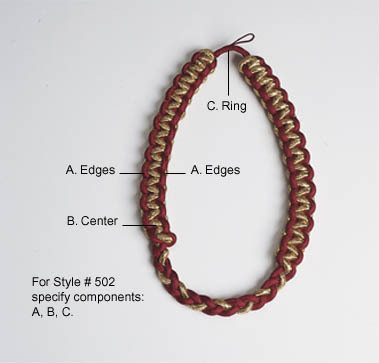 In addition, you will be assured that the accessory or color you select will be suitable for your needs. Two-Tone Cords. Specify Nylon, Polyester or other material if applicable. 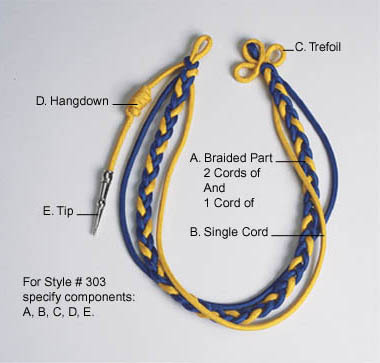 Format of Colors if ordering Two-Tone Braids. Specify Nylon, Polyester or other material if applicable. To place an Order please fax 1-800-743-9406, 24 hours a day. from 9 am to 5 pm, Monday through Friday, Eastern Standard Time. All orders require confirmation via fax. Special Custom Service orders welcome, please send sample along with your request. Over forty years of service to the industry.